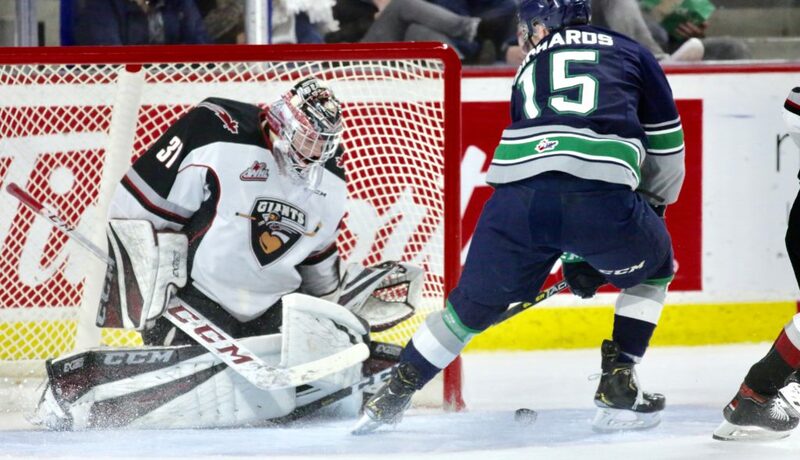 VANCOUVER, BC, March 23, 2019 — Goalie Roddy Ross had 39 saves Saturday night at the Langley Events Centre to lead the Seattle Thunderbirds to a 4-1 victory over the Vancouver Giants in Game 2 of a first round playoff series. Seattle took a 1-0 lead at 4:38 of the first period just after a power play ended. Simon Kubicek brought the puck out from behind the T-Birds net and at the blue line hit Sean Richards with with a pass on the left wing. Richards quickly sent the puck to Jaxan Kaluski who sent it right back to Richards who carried it into the offensive zone. Richards beat Vancouver goalie Trent Miner from the goal line with a sharp angle shot that went over Miner’s right shoulder and hit the far corner just inside the post. Kubicek put the T-Birds up 2-0 with a power-play goal at 15:09 of the first. Richards had the puck on the left boards and sent it to Kubicek at the left point. Kubicek skated into center ice and put a wrist shot on goal with Payton Mount screening Miner. Kubicek’s shot beat Miner on the blocker side. Nolan Volcan had the second assist. The Giants cut the T-Birds lead to one on a power-play goal by Jadon Joseph at 18:10 of the first. The teams played a scoreless second period that was tight checking and a good road period for the T-Birds. Andrej Kukuca put the T-Birds in front 3-1 at 4:35 of the third period. Owen Williams popped the puck to Kukuca to spring him on a two-on-one break with Kaluski. Kukuca came down the right wing and snapped a wrist shot over Miner’s left shoulder for his second goal of the playoffs. Volcan had the second assist. Vancouver pulled Miner with 2:22 left in the game for an extra attacker. After Ross made a save the Giants called a time out with just over two minutes left in the game. The T-Birds won the ensuing faceoff and Tyler Carpendale fed Volcan who hit the empty net at 17:58 to seal the win. Tyrel Bauer had the second assist. Miner had 24 saves on 27 shots. First period – 1, Seattle, Richards 1 (Kaluski, Kubicek), 4:38. 2, Seattle, Kubicek 1 (Richards, Volcan), 15:09 (pp). 3, Vancouver, Joseph 2 (Roman, Plouffe), 18:10 (pp). Penalties – Roman, Van (high-sticking), 2:29. Richards, Sea (hooking), 7:29. Nielsen, Van (delay of game), 14:00. Rybinski, Sea (tripping), 16:53. Second period – No scoring. Penalties – Wedman, Sea (interference), 9:42. Wedman, Sea (cross checking), 12:39. Third period – 4, Seattle, Kukuca 2 (Williams, Volcan), 4:33. 5, Seattle, Volcan 1 (Carpendale, Bauer), 17:58 (en). Penalties – No penalties. Shots on goal – Seattle 8-9-11 28, Vancouver 12-11-17 40. Goalies – Seattle, Ross 40 shots-39 saves (1-1); Vancouver, Miner 27-24 (1-1). Power plays – Seattle 1-2; Vancouver 1-4. A – 3,726. Referees – Brett Iverson, Troy Paterson. Linesmen – Nick Albinati, Nathan Van Oosten.